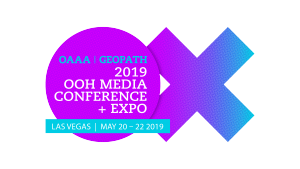 Mike Benson, head of marketing at Amazon Studios and director of marketing for Prime Video, will address attendees of this year’s 2019 OAAA\Geopath OOH Media Conference + Expo, being held May 20-22 at the Aria Resort in Las Vegas. Since 2015, Mike Benson has overseen all marketing, promotion, advertising, digital, and social media activities and branding for Amazon Prime Video original programming. Prior to his role at Amazon Studios, Mike Benson was Chief Creative Officer for the Time Warner Global Media Group. Before that, he was the Executive Vice President of Marketing at Disney/ABC Television Group, overseeing marketing, advertising, and promotion for ABC primetime, late night, and ABC Studios programming. Further information and registration for the conference is available here. This entry was posted on Thursday, March 7th, 2019 at 02:33 @148 and is filed under DailyDOOH Update. You can follow any responses to this entry through the RSS 2.0 feed. You can leave a response, or trackback from your own site.